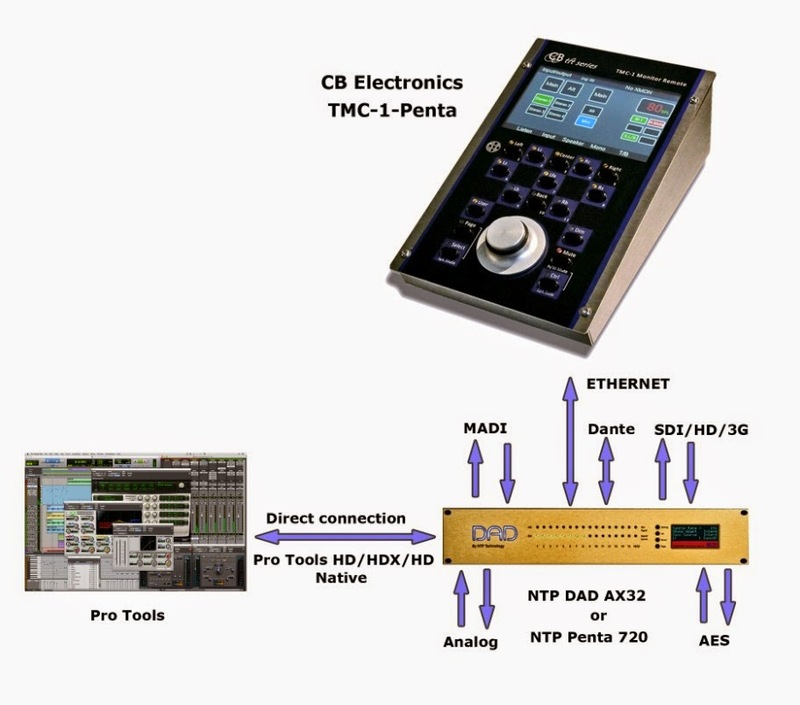 CB Electronics (www.colinbroad.com) in cooperation with NTP Technology (www.ntp.dk) have developed a digital version of the TMC-1 monitor controller TMC-1-Penta which will be launched at NAB 2015. The TMC-1-Penta communicates with a Penta 720 or DAD AX32 over ethernet using its native protocol either directly or over a network. The software is based on the XMON version of the TMC-1 with a number of enhancements including the ability to control up to 48 channels on its main input/output and an 8 channel wide Stem Mixer. The flexibility of the NTP Digital interface allows the incorporation of extra features that are not available on Avid’s XMON. The DAD AX32/NTP Penta combines direct connection to Pro Tools HD/HDX/HD Native systems with superb A2D/D2A converters, Madi, AES and SPI. The combination of the DAD AX32 / NTP Penta with the TMC-1-Penta provides a cost effective digital I/O and monitoring solution for any studio. The block diagram below shows how to use the TMC-1 and NTP Penta 720 or DAD AX32 for digital monitoring and DAW I/O. The Penta 720/AX32 provides all the I/O routing with 16 AES I/O channels, Madi and direct connection with Pro tools as standard. Also available as optional cards are Analog I/O, Dante, SDI and other interfaces providing up to 976 input channels and 976 output channels. Visit NTP Technology on the Sanken/Plus 24 stand at NAB - C4051 Hall C.